Chronic kidney disease (CKD) is a national public health problem beset by inequities in incidence, prevalence, and complications across gender, race/ethnicity, and socioeconomic status. As health care providers, we can directly address some factors crucial for closing the disparities gap. Other factors are seemingly beyond our reach, entrenched within the fabric of our society, such as social injustice and human indifference. Paradoxically, the existence of health inequities provides unique, unrecognized opportunities for understanding biologic, environmental, sociocultural, and health care system factors that can lead to improved clinical outcomes. Several recent reports documented that structured medical care systems can reduce many CKD-related disparities and improve patient outcomes. Can the moral imperative to eliminate CKD inequities inspire the nephrology community not only to advocate for but also to demand high-quality, structured health care delivery systems for all Americans in the context of social reform that improves the ecology, health, and well-being of our communities? If so, then perhaps we can eliminate the unacceptable premature morbidity and mortality associated with CKD and the tragedy of health inequities. By so doing, we could become global leaders not only in medical technology, as we currently are, but also in health promotion and disease prevention, truly leaving no patient behind. Chronic kidney disease (CKD) has recently become recognized as a global public health problem.1–3 CKD and, to a greater extent, ESRD are characterized by marked differences in incidence, prevalence, and/or complications across gender, age, race/ethnicity, socioeconomic status, and geographic boundaries. These traits may confer either protection or increased risk for certain health practices and medical conditions, suggesting there is much to learn beyond the traditional risk factors contributing to CKD and CKD-associated complications.4–7 ESRD is one of the most dramatic examples of health disparities, with rates for minorities ranging from 1.5 to 4.0 times those of age-adjusted white counterparts,6 despite similar rates for the early stages of CKD.8 Although CKD is associated with increased rates of premature mortality,9,10 adjusted ESRD survival rates are paradoxically better for minorities.11 The Institute of Medicine notes that inequities in health outcomes can arise from within the health care system, such as the operation of health care systems, and the legal and regulatory climate or from ecologic factors, such as clinical appropriateness and need, and patient preferences, although significant overlap exists, for example, discrimination, biases and prejudice, stereotyping, and uncertainty. The Institute of Medicine defines disparities in health care as differences that generally represent institutional or provider biases that are unjust, even if unintentional (Figure 1).12,13 Unfortunately, the contribution of factors such as patient beliefs and preferences are commonly overlooked when ascribing disparities to health care systems and/or providers. Differences, disparities, and discrimination. Adapted from reference (12), with permission. The term “health disparities,” however, is frequently used to describe the adverse health outcomes experienced by racial/ethnic minorities that occur in the context of broad historic and contemporary social and economic inequality,14–16 as well as health care system factors.12,17–19 De facto racial segregation remains prevalent within US health care systems, while limited revenues and reduced capacity for health care delivery constrain organizations dedicated to the care of poor and often largely minority populations.20 Residential segregation, which was federal policy up to the civil rights movement21 and continues today as mortgage discrimination, leads to racially divided communities that may share low-income status but often differ in wealth, community assets, exposure to heavy metals or excess ambient air particulate matter, and other variables that may influence CKD-related outcomes.22,23 Geographic analyses revealed community-level poverty was strongly associated with higher ESRD incidence but was a more powerful predictor for black than for white individuals.24 Dialysis facilities located in predominantly black communities have higher mortality rates and lesser compliance with recommended performance targets.25 As we refine our understanding of health disparities, we might be able to move beyond the racial and ethnic background as the defining risk for CKD progression and directly target the underlying biologic and sociocultural factors for which race and ethnicity may be surrogates. WHY FOCUS ON HEALTH DISPARITIES? One challenge for the nephrology community as well as the broader medical community is to rethink how we might improve each element that conspires to constrain the health outcomes we are trying to achieve, not just those limited to a procedure or prescription. The focus of this review is to bring greater awareness of and discuss strategies to address some of the key social and environmental factors that contribute to CKD disparities and improve US health care systems to care effectively for an increasingly diverse CKD patient population. 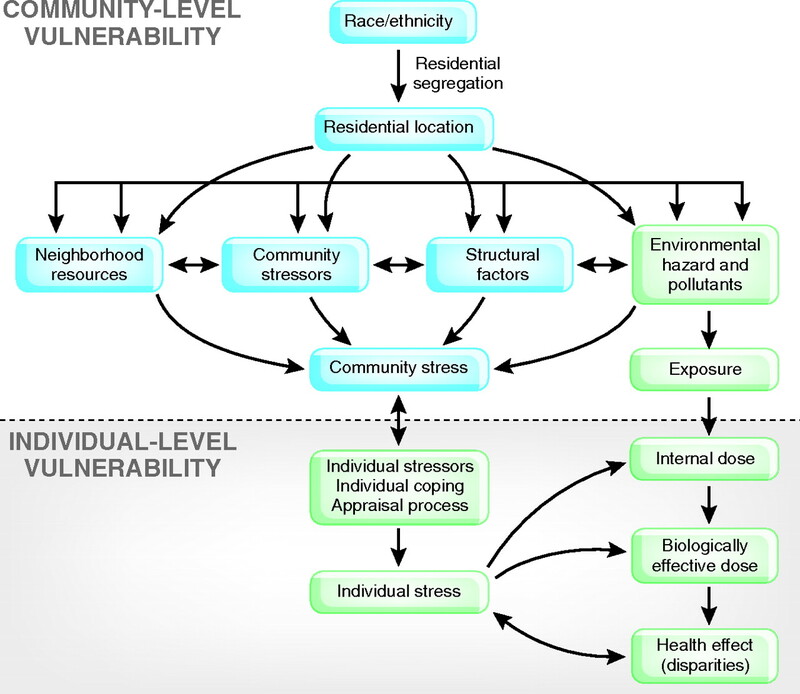 A framework for environmental health disparities. Reprinted from reference (23), with permission. A framework for integrating key sociocultural determinants of CKD. Adapted from reference (29), with permission. Specific to CKD are marked variations in the prevalence of key risk factors such as diabetes, hypertension, and albuminuria across socioeconomic, gender, and racial/ethnic groups that play an important role in group differences in the prevalence, progression, and complications of CKD.31–36 Although there may be biologic variations among racial and ethnic groups, the emerging data from the human genome project suggest that these interracial variations are modest at best and much smaller than intraracial variations.37,38 Indeed, biologic variations are more common across gender than race/ethnicity. Select biologically based factors may have both racial and nonracial contributions, such as hypovitaminosis D, which may be related to increased melanin and reduced ultraviolet conversion of previtamin D as well as nutritional deficiency. Hypovitaminosis D is associated with increased rates of CKD initiation factors such as hypertension and diabetes39 and progression factors such as inflammation and fibrosis,40 whereas vitamin D repletion may improve CKD-related mortality.7 Environmental influences modify gene and/or receptor expression (gene–environmental) as supported by genetic linkage studies describing susceptibility genes for CKD.41 Increased rates of overexpression of TGF-β1 and/or a higher prevalence of specific TGF-β1 polymorphisms in black individuals may contribute to CKD progression and complications.41a Sickle cell trait (approximately 8% of black individuals), which has traditionally been described as causing renal microinfarction and hyposthenuria42 but not CKD, may in fact be an important unrecognized factor for CKD progression and complications. Despite the high level of national wealth in the United States, the lack of adequate health insurance for many of the nation's indigent and working middle class is also disproportionately common among racial and ethnic minorities31 and further contributes to the inability of such patients to receive adequate CKD and pre-ESRD care. Several recent studies4,12,13,52,53 but not all54,55 have highlighted racial and ethnic disparities within the health care delivery system, ranging from reduced levels of quality services to poor outcomes. Several of these findings underscore the institutionalization of biases within many health care delivery systems, whereas others point to no insurance, underinsurance, lack of access to quality care, and/or multiple payer or nonuniform systems of care as the major driving forces for disparities in health care outcomes. Although many studies have demonstrated that improvements in access and standardization of care can reduce disparities in many chronic health conditions, many CKD-related outcomes remain outliers. Examining diabetes-related complications in an ethnically diverse population with standardized health care coverage, Karter et al.55 found similar or reduced rates of complications in minority enrollees in comparison with white enrollees, with the exception of developing ESRD, which was significantly more common across all minority groups compared with white individuals. This unique finding that only CKD outcomes did not improve for minorities when care was standardized suggests that there may be non–health care system factors that are important for kidney-related outcomes and/or that additional novel quality care indicators are important for patients with CKD. ESRD is unique, in that most patients are covered by Medicare, and is generally characterized by equity in access to care,56,57 except awaiting cadaveric-donor renal transplantation, for which standardized health care reduces the black–white difference but significant differences still exist,58 most likely as a result of cultural health beliefs and practices. A recent report by Gao et al.59 of >13,000 beneficiaries receiving care through the Department of Defense, a standardized health care delivery system, found similar rates of provider compliance for black and white patients for stages 3 and 4 CKD targets. Follow-up on ESRD rates will help to provide insights into the effects of quality care on CKD progression across gender and racial/ethnic groups. Despite several study limitations, these findings strongly support the possibility for dramatic attenuation of socioeconomic, gender, and racial/ethnic disparities for patients who have CKD and are treated within a standardized or single-payer health care delivery system. As a medical profession, we too frequently believe that many health issues are beyond our impact, citing them as societal issues, not realizing that we are society,61–63 while our apathy and inaction only perpetuate the current state of affairs. For a moment, let's imagine that we actually embrace the moral imperative of health equity: What might be implemented to improve our understanding and respect of our patients’ diverse cultural values, transform our institutions and social structures to promote health and well-being, and generate the advocacy skills that will be needed to make universal access and quality uniform health care a reality? The chronic care model. Reprinted from reference (74), with permission. Dr. Claude Lenfant, former director of the National Institutes of Health National Heart, Lung, and Blood Institute, noted, “Enormous amounts of new knowledge are barreling down the information highway, but they are not arriving at the doorsteps of our patients, especially for a disproportionately high percentage of women, racial and ethnic minorities, and other high-risk groups in the US health care system.”75 He emphasized multidisciplinary or translational research approaches, including rigorous research, to improve health care systems and provider–patient interfaces. For CKD, this translates into research investments in renal biology and pathophysiology in the context of patient- and community-level influences.76 Disparities in CKD have paved a unique roadmap for promising opportunities for research investment, including promising naturally occurring cost-effective interventions such as vitamin D77 or emerging novel peptides such as FT061452, a glutathione precursor with vitamin implications,78 which are more likely to be highly embraced by low-resource and minority communities. Inequities in the incidence, prevalence, and treatment of CKD/ESRD are well documented and vary among different minority groups. Despite the progress made, many of the diverse factors that influence the initiation and progression of CKD and the disparities therein are not fully understood. Although modifiable risk factors, such as culture, socioeconomic status, and access to medical care, contribute to a large proportion of CKD disparities, additional risk factors, from emerging biomarkers to providing structured and coordinated health care delivery, remain to be defined more clearly. To improve the care of diverse communities, medical research alone is insufficient. Efforts to address lingering social injustices that perpetuate limited educational opportunities, socioeconomic imbalances, and limited access to health care are needed to ensure that the contributions of advancing medical care will have a clinically relevant impact on improving patient outcomes (Table 3). The nephrology community has the opportunity to address not only inequities within health care systems but also many of the sensitive issues that underlie the propagation of community-level health disparities, including elimination of injustices embedded within the social systems that influence health and health care and the promotion and inculcation of community-level and personal responsibility for health- and health care–related behaviors.79–81 In addition, the nephrology community can take a leadership role in a re-conceptualization of the medical community's understanding of health so that our society and health-related systems are focused on well-being and true prevention, not just early detection or reactive acute care. The word “health” is derived from the Anglo-Saxon root “hale,” which means to be whole. Our present focus on medical care and creating a medical care workforce must change to a broader focus on health, enabling us to recapture the true calling of the physician, and the actualization of a vision of insurance, medical, and related systems of “health” care that can provide uniform quality care based on the patient as a human being and truly considering care as holistic. K.N. is supported in part by the National Center for Research Resources, Research Centers in Minority Institutions (RR14616, RR11145, and RR019234), and the DREW/UCLA Project EXPORT, National Institutes of Health, National Center on Minority Health and Health Disparities (P20-MD00182). A.N. is supported in part by the National Center for Research Resources, Research Centers in Minority Institutions (U54 RR019234), and the Richard Rosenthal Dialysis Fund. Presented in part as “Race, Gender, and Socioeconomic Disparities in CKD in the United States” at the American Society of Nephrology Symposium for Health Disparities in Nephrology; October 31 through November 5, 2007; San Francisco, CA. See related editorial, “Is the Ethnic Disparity in CKD a Symptom of Dysfunctional Primary Care in the US?” on pages 1249–1251. Is the Malnutrition-Inflammation Complex the Secret behind Greater Survival of African-American Dialysis Patients? How Long Can We Afford to Wait for Equity in the Renal Transplant Waiting List? Is the Ethnic Disparity in CKD a Symptom of Dysfunctional Primary Care in the US?